Callout shape is a label that is used for explanation on your model elements. 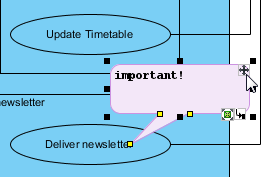 Inserting callout shape aims to draw others' attention and give them additional remarks. Basically, its function is similar to a photo caption or a comment. However, it does more than merely either a photo caption or a comment. In fact, it looks more likely to a dialog box that you can place it next to your model elements. 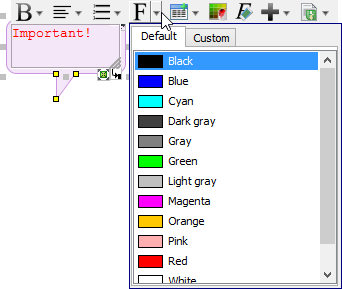 A remark can be inserted by selecting Callout from the diagram toolbar and dragging it to the model elements directly on the diagram pane. The direction of callout shape pointer can be adjusted by simply dragging the pointer's end. 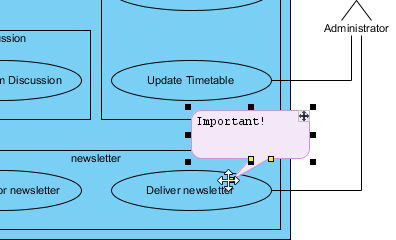 The pointer can be adjusted to point out a more specific position, such as pointing to the name of diagram element or a specific class member (attribute/operation) out of a class. NOTE: You can adjust not only the pointer's direction, but also its length. The position of callout shape can be moved by dragging the + icon that is located on the top right corner of the callout. This icon is used to reposition the shape in a straight and simple way. NOTE: The callout shape will be moved but the position of its pointer won't be changed if you only drag the + icon. This helps you to remain the pointing and move the callout shape simultaneously. The content of callout shape can be edited by double clicking on the callout shape. Formatting buttons can be used to insert formatting for the text in order to emphasize your key points while you are editing the content, such as changing font color. This helps to enhance the visual effect of the text as well.